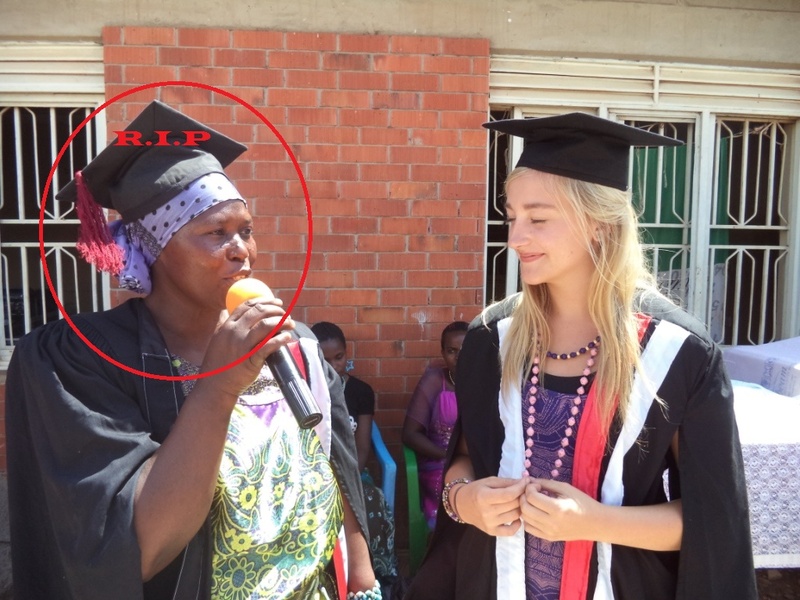 Her death…….A huge loss to the community! The death of a Great Women activist in Mukono District. KIDA accounts the community loss! 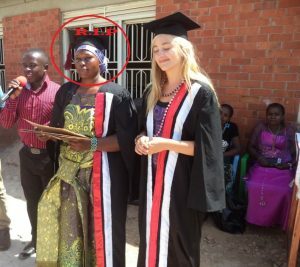 Late Ms. Mastulla Namaganda (circled above) has been the women Councillor (Representative) for Ntenjeru Sub-county in Mukono District, passed away and buried to rest forever last week on Sunday. I personally known Mastullah in 2013, when i was carrying out a feasibility research about introducing a skills enhancement program for single teenage mothers, orphans and jobless youths in Katosi community, a landing site on the south of Lake Victoria. At that time, Mastullah was serving as a local council secretary but actively working as a general official for the whole local council of katosi community, meaning that she was the general person to contact for all matters of this community. I reached her for consultation and advice on how best to implement the skills training project in the area she was leading and had served for many years. She was so welcoming to all ideas and sounded so supportive to the goals of the project. 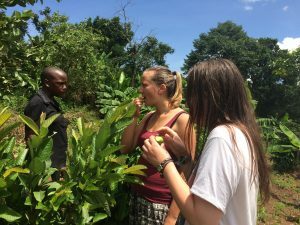 We initially worked together in identifying the most vulnerable girls and women for the first training phase and finally together with her, we opened up the first training session with 5-most vulnerable girls with support from Step Up Uganda (USA). 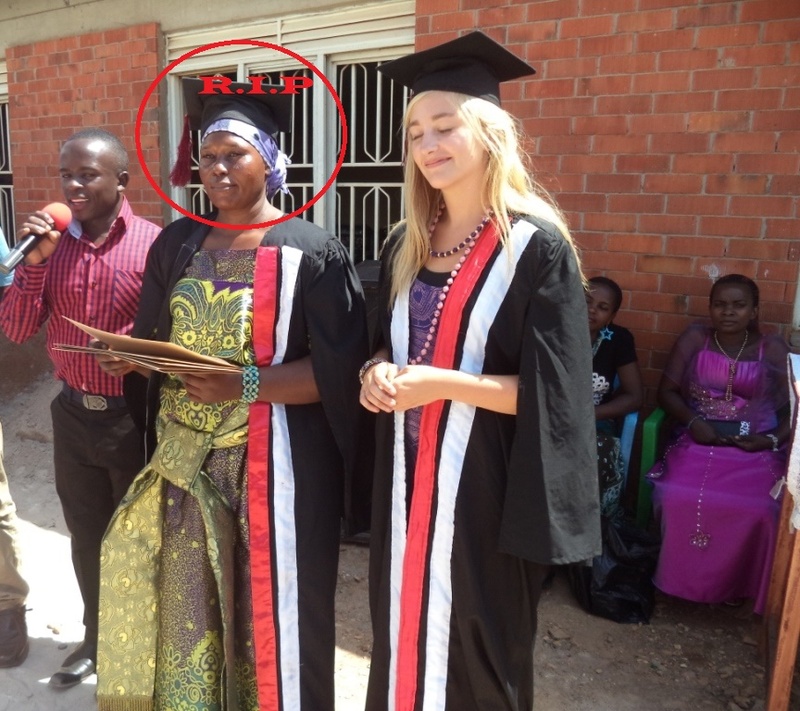 She presided our first graduation and gave a tremendous speech to the girls and community members attended, awaken the minds of girls and women to have skills. Before she died, she was serving as a subcounty women councilor, representing the women of Ntenjeru Subcounty (including those of her own Katosi community) at the District Assembly. She presented a lot of women ideas and needs to the District Assembly and genuinely struggled to bring positive feedback to the people she represented. Her struggle contributed to many benefits to the women (especially girls) which included provision of adult learning centers, skills training programs supported by AVSI Foundation, sensitization on land rights supported by International Justice Mission and so much more. On the other hand, Mastulla was an active member of a large community NGO known as Katosi Women Development Trust (KWDT), serving as a field assistant in 2013 and genuinely engaged in many developmental policies benefiting the women involved in fishing, farming and trade activities. I also learned that she was an active tool in encouraging women to work hard to benefit from many KWDT projects such as group micro loans, revolving water tank scheme among others. She was a hardworking widow, running a fishing, tailoring (sewing) and trading businesses in Katosi community, ahead of serving as a political leader and therefore served as a good example to women especially widows that women are ambitious and can still live to the top of their dreams even after the death of their husbands. This spearheaded many Agro-forestry projects around this community and more especially on the lake shores to prevent erosion. As an active and general local council executive leader, Mastulla settled many community and family disputes and i could put it right that every citizen referred to her for assistance. We also account and credit her for fighting child labor (cutting the number of children involved in fishing), illegal fishing, child sacrifice, child & women abuse, domestic violence, illegal land acquisition, women (widows) rights and many more. As Katosi Intercommunity Development Alliance, we account this as a great loss to the community we serve and drive towards change and development. Our community change approach works in partnership with community leaders to physically identify community needs, find a suitable solution and implement it. So far, this approach has been applicable with assistance of active leaders and Mastulla was one of those leaders. She served a very good example to the community, therefore,the work we have now is to continue working hard to bridge the gap, lift her legacy and permanently sustain the change we have achieved together during her time. As a writer, this is just a piece of what Mastulla did for her people and community. May the Lord grant her soul an eternal rest! 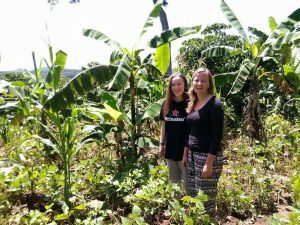 Hello, two mzungu’s here, we are Katie from Ireland and Julia from Austria. 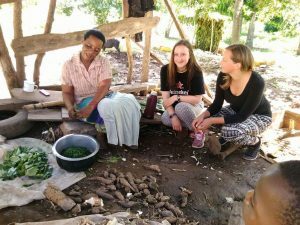 As we are volunteering with KIDA we got involved in one of their projects and in doing so we spent a week at the house of the family of Gertrude Serwadda . In this family, the mother is not only a widow but also the mother to a staggering amount of 13 kids. The kids were aged from 9 to 36 and also two more little ones running around aged 3 and 7 whom were children of one of the oldest daughters. 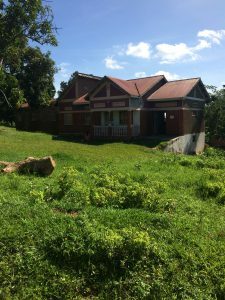 Their land consists of mainly farmland and the family home which in Ugandan standards is considered quite big but in fact is quite small for the number of family members living there. Although the vast size of land they own​the crops they grow only go towards the families daily meals. Leaving them with not many options to obtain an income. 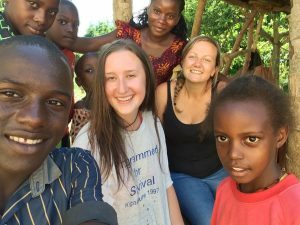 From the first day we could see how the family operate with little to no money and the daily challenges they face especially since the passing of their deceased father. However although they have many obstacles every day we could see that their mother is truly a strong and hardworking woman and doesn’t let this fact overcome her determination to maintain her family’s well-being. Early morning we arrived and began our day picking beans and conversing with the children. 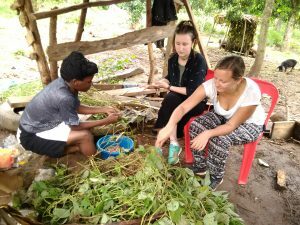 After spending a week we discovered depending on season most daily life remains quite the same as there were only so many crops to harvest and later prepare meals with. 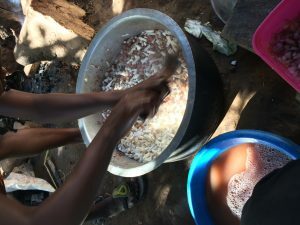 The week while we were there it was the season for beans and cassava which meant for this season the children ate nearly the same meal every day.This was just one of many things we noticed during our stay. 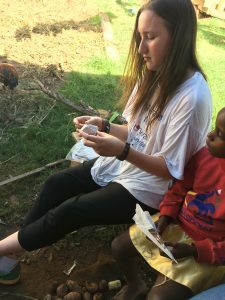 Other things that come to light were the problems such as some of the children not having shoes resulting in jiggers in the feet and the fact that due to lack of money many of the children could not continue or even begin with their education. One thing that struck us most was how the children talked about their sufferings so openly and with ease which gave us an insight to their perspective of how normal theirlife is for them but for us it was heart breaking to hear of such sufferings and their down beaten path. We are happy to have been welcomed in to this family’s​home and to have the opportunity to experience what we did. We not only got a cultural experience but an eye opener to people’s daily lives here which made us content with our stay here and more importantly getting involved with KIDA. Many thanks to everyone at KIDA and we wish them luck with continuing to do the wonderful work they do!